Satellite remote sensing of ocean color is an invaluable tool for assessing the productivity of marine ecosystems and monitoring changes resulting from climatic or environmental influences. Yet water-leaving radiance comprises less than 10% of the signal measured from space, making correction for absorption and scattering by the intervening atmosphere imperative. Traditional ocean color algorithms are based on a standard set of aerosol models and the assumption of negligible water-leaving radiance in the nearinfrared. Modern improvements have been developed to handle absorbing aerosols such as urban particulates in coastal areas and transported desert dust over the open ocean, where ocean fertilization can impact biological productivity at the base of the marine food chain. Even so, imperfect knowledge of the absorbing aerosol optical properties or height distribution results in well-documented sources of error. At short wavelengths, where PACE spectrometry intends to improve the separation of chlorophyll from CDOM as well as quantify different phytosynthetic pigments contributing to light absorption spectra, these problems are amplified due to the increased Rayleigh and aerosol optical depth, especially at off-nadir view angles. This proposal is to the Atmospheric Correction category of the PACE Science Team. Through sensitivity studies and simulated retrievals employing both Mie and nonspherical particle scattering codes in conjunction with a vector Markov Chain radiative transfer code, we will quantitatively evaluate the relative merits of various measurement modalities for meeting the PACE Science Definition Team uncertainty requirements of max (5%, 0.001) in water-leaving reflectance in the visible and max (10%, 0.002) in the near-UV. In particular we will quantify water leaving radiance measurement uncertainty in the presence of absorbing aerosols from ultraviolet observations at single view angles representative for the PACE ocean color spectrometer. 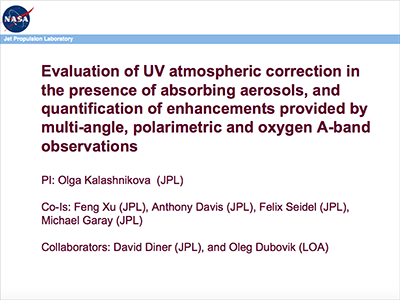 Then we investigate the added value of observations from (a) multiangle UV radiometry, (b) multiangle visible photopolarimetry, and (c) oxygen A-band for simultaneous characterization of absorbing aerosol microphysical properties, effective altitude, and non-zero water-leaving radiance. Bio-optical models will be used to characterize surface bidirectional reflectances. 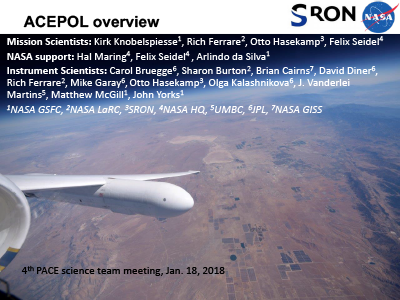 Theoretical sensitivities will be then evaluated against AirMSPI observations at AERONET-OC UC SeaPrism site collected during PODEX, SEAC4RS, and HyspIRI campaigns. 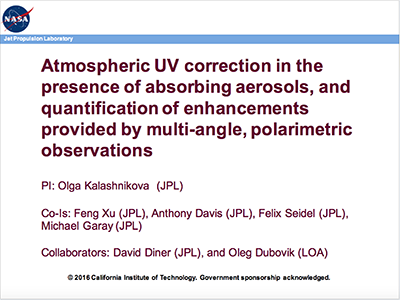 Measurements by TOMS, OMI, and JPL's airborne sensor AirMSPI demonstrate the importance of UV observations for detecting absorbing aerosols. Theoretically, multiangle UV radiometry, blue wavelength polarimetry, and narrowband (~5 nm) oxygen A-band measurements have the potential to estimate aerosol height. Our experience with MISR demonstrates the ability of multiangular radiances to distinguish dust from other airborne particles, and shows the value of such observations for separating aerosol and surface scattering over non-black ocean waters. Polarimetry offers additional constraints on aerosol size distribution and real refractive index. Drawing upon our expertise in aerosol remote sensing instrumentation and associated aerosol and surface retrieval algorithm development for MISR, AirMSPI, and AirMSPI- 2, we will refine the requirements for a PACE imager with multiangular, UV-shortwave infrared, A-band, and polarimetric sensing capability (the polarimeter), assess the practicality of the required observations, and quantify the added value of imaging polarimeter to the PACE ocean color spectrometer in compensating for the effects of absorbing aerosols. Xu, F., Dubovik, O., Zhai, P.-W., Diner, D.J., Kalashnikova, O.V., Seidel, F.C., Litvinov, P., Bovchaliuk, A., Garay, M.J., van Harten, G., and Davis, A.B. (2016). Joint Retrieval of Aerosol and Water-Leaving Radiance from Multi-Spectral, Multi-Angular and Polarimetric Measurements Over Ocean, Atmos. Meas. Tech., 9, 2877-2907, doi: 10.5194/amt-9-2877-2016. Lee, H., Kalashnikova, O.V., Suzuki, K., Braverman, A., Garay, M.J., and Kahn, R.A. (2016). Climatology of the Aerosol Optical Depth by Components from the Multi-Angle Imaging Spectroradiometer (MISR) and Chemistry Transport Models, Atmos. Chem. Phys., 16, 6627-6640, doi: 10.5194/acp-16-6627-2016. Notaro, M., Yu, Y., and Kalashnikova, O.V. (2015). Regime Shift in Arabian Dust Activity, Triggered by Persistent Fertile Crescent Drought, J. Geophys. Res. Atmos., 120(19), 10229-10249, doi:10.1002/2015JD023855. Tosca, M.G., Diner, D.J., Garay, M.J., and Kalashnikova, O.V. (2015). Human-Caused Fires Limit Convection in Tropical Africa: First Temporal Observations and Attribution, Geophys. Res. Lett., 42(15), 6492-6501, doi: 10.1002/2015GL065063. Kishcha, P., da Silva, A.M., Starobinets, B., Long, C.N., Kalashnikova, O.V., and Alpert, P. (2015). Saharan Dust as a Causal Factor Of Hemispheric Asymmetry in Aerosols and Cloud Cover Over the Tropical Atlantic Ocean, Int. J. Remote Sens., 36(13), 3423-3445, doi: 10.1080/01431161.2015.1060646. Tosca, M.G., Diner, D.J., Garay, M.J., and Kalashnikova, O.V. (2014). Observational Evidence of Fire-Driven Reduction of Cloud Fraction in Tropical Africa, J. Geophys. Res. Atmos., 119(13), 8418-8432, doi: 10.1002/2014JD021759. Yu, Y., Notaro, M., Liu, Z., Kalashnikova, O., Alkolibi, F., Fadda, E., and Bakhrjy, F. (2013). Assessing Temporal and Spatial Variations in Atmospheric Dust Over Saudi Arabia Through Satellite, Radiometric, and Station Data, J. Geophys. Res., 118(23), 13253-13264, doi: 10.1002/2013JD020677. Sokolik, I.N., Darmenova, K., Huang, J., Kalashnikova, O., Kurosaki, Y., and Xi, X. (2013). Examining Changes in Land Cover and Land Use, Regional Climate and Dust in Dryland East Asia and their Linkages within the Earth System, In Dryland East Asia: Land Dynamics Amid Social and Climate Change (Eds., Chen, J., Wan, S. Henebry, G., Qi, J., Gutman, G., Sun, G., Kappas, M.), De Gruyter, 185-213. Banks, J.R., Brindley, H.E., Flamant, C., Garay, M.J., Hsu, N.C., Kalashnikova, O.V., Kluser, L., and Sayer, A.M. (2013). Intercomparison of Satellite Dust Retrieval Products over the West African Sahara Euring the Fennec Campaign in June 2011, Rem. Sens. Envir., 136, 99-116, doi: 10.1016/j.rse.2013.05.003. Kalashnikova, O.V., Garay, M.J., Martonchik, J.V., and Diner, D.J. (2013). MISR Dark Water Aerosol Retrievals: Operational Algorithm Sensitivity to Particle Non-sphericity, Atmos. Meas. Tech., 6, 2131-2154, doi:10.5194/amt-6-2131-2013. Ceccato P., Trzaska, S., Perez, C., Kalashnikova, O., del Corral, J., Cousin, R., Blumenthal, M.B., and Thomson, M.C. (2013). Improving Decision-Making Activities for Meningitis and Malaria, Geocarto Int., 29(1), 19-38, doi:10.1080/10106049.2013.827749. Guo Y., Tian, B., Kahn, R.A., Kalashnikova, O.V., Wong, S., and Waliser, D. (2013). Tropical Atlantic Dust and Smoke Aerosol Variabilities Related to the Madden-Julian Oscillation on MODIS and MISR Observations, J. Geophys. Res., 118(10), 4947-4963, doi: 10.1002/jgrd.50409. Yang, W., Marshak, A., Varnai, T., Kalashnikova, O., and Kostinski, A. (2012). CALIPSO Observations of Transatlantic Dust: Vertical Stratification and Effect of Clouds, Atmos. Chem. Phys., 12, 11339-11354, doi: 10.5194/acp-12-11339-2012. Alston E.J., Sokolik, I.N., and Kalashnikova, O.V. (2011). Seasonal and Interannual Variability of Atmospheric Aerosols in the U. S. Southeast from Ground and Space Based Measurements Over the Past Decade, Atmos. Meas. Tech. Discuss., 4, 7559-7595, 2011, doi:10.5194/amtd-4-7559-2011. Kishcha, P., Starobinets, B., Kalashnikova, O.V., and Alpert, P. (2011). Aerosol Optical Thickness Trends and Population Growth in the Indian Subcontinent, Int. J. Remote Sens., 32(24), 9137-9149, doi: 10.1080/01431161.2010.550333. Kalashnikova, O.V., Garay, M.J., Kahn, R.A., Diner, D.J., Martonchik, J.V., Lee, J.N., Torres, O., Yang, W., Marshak, A., Kassabian, S., and Chodas, M. (2011). Capabilities of MISR Aerosol Retrievals in Dust-laden Conditions, Proc. SPIE, 8177, 81770O, doi: 10.1117/12.897773. Kalashnikova, O.V., Garay, M.J., Davis, A.B. Diner, D.J., and and Martonchik, J.V. (2011). 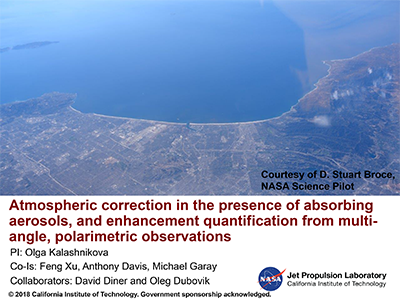 Sensitivity of Multi-angle Photo-polarimetry to Vertical Layering and Mixing of Absorbing Aerosols: Quantifying Measurement Uncertainties, J. Quant. Spectrosc. Ra., 112(13), 2149-2163, doi: 10.1016/j.jqsrt.2011.05.010. Hansell Jr., R.A., Reid, J.S., Tsay, S.C., Roush, T. L., and Kalashnikova, O.V. (2011). A Sensitivity Study on the Effects of Particle Chemistry, Asphericity and Size on the Mass Extinction Efficiency of Mineral Dust in the Earth's Atmosphere: From the Near to Thermal IR, Atmos. Chem. Phys., 11, 1527-1547, doi:10.5194/acp-11-1527-2011. Kalashnikova, O.V., Garay, M.J., Davis, A.B., Diner, D.J., and Martonchik, J.V. (2011). Photo-polarimetric Sensitivities to Layering and Mixing of Absorbing Aerosols, Proceedings of the 13th Conference on Electromagnetic and Light Scattering, AAPP, 89(1). Kishcha, P., Starobinets, B., Kalashnikova, O., Long, C.N., and Alpert, P. (2009). Variations of Meridional Aerosol Distribution and Solar Dimming, J. Geophys. Res., 114(D10), D00D14, doi:10.1029/2008JD010975. Kalashnikova, O.V. and Kahn, R.A. (2008). Mineral Dust Plume Evolution over the Atlantic from MISR and MODIS Aerosol Retrievals, J. Geophys. Res., 113(D24), D24204, doi:10.1029/2008JD010083. Kalashnikova, O.V., Hsu, N.C., and Kahn, R.A. (2008). Capabilities and Limitations of Space-borne Passive Remote Rensing of Dust, Proceeding of the 3rd International Dust Workshop, Leipzig, 2008. Kalashnikova, O.V., Mills, F.P., Eldering, A., and Anderson, D. (2006). Application of Satellite and Ground-based Data to Investigate the UV Radiative Effects of Australian Aerosols, Rem. Sens. Envir., 107(1-2), 65-80, doi:10.1016/j.rse.2006.07.025. Kalashnikova, O.V. and Kahn, R. (2006). Ability of Multiangle Remote Sensing Observations to Identify and Distinguish Mineral Dust Types: Sensitivity Over Dark Water, J. Geophys. Res.,111(D11), D11207, doi:10.1029/2005JD006756. Kalashnikova, O.V., Kahn, R, Sokolik, I.N., and Li, W.-H. (2005). The Ability of Multi-angle Remote Sensing Observations to Identify and Distinguish Mineral Dust Types: Optical Models and Retrievals of Optically Thick Plumes, J. Geophys. Res., 110(D18), D18S14, doi:10.1029/2004JD004550. Kahn, R., Anderson, J., Anderson, T.L., Bates, T., Brechtel, F., Carrico, C.M., Clarke, A., Doherty, S.J., Dutton, E., Flagan, R., Frouin, R., Fukushima, H., Holben, B., Howell, S., Huebert, B., Jefferson, A., Jonsson, H., Kalashnikova, O., Kim, J., Kim, S.-W., Kus, P., Li, W.-H., Livingston, J.M., McNaughton, C., Merrill, J., Mukai, S., Murayama, T., Nakajima, T., Quinn, P., Redemann, J., Rood, M., Russell, P., Sano, I., Schmid, B., Seinfeld, J., Sugimoto, N., Wang, J., Welton, E.J., Won, J.-G., and Yoon, S.C. (2004). Environmental Snapshots from ACE-Asia, J. Geophys. Res., 109, D19S14, doi:10.1029/2003JD004339. Kalashnikova, O.V. and Sokolik, I.N. (2004). Modeling the Radiative Properties of Nonspherical Soil-derived Mineral Aerosols, J. Quant. Spectrosc. Ra., 7(2), 137-166, doi:10.1016/j.jqsrt.2003.12.026. 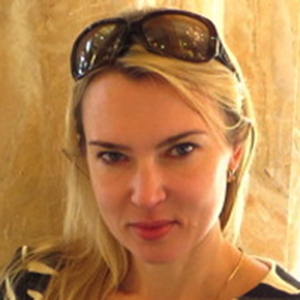 Kalashnikova O.V. and Sokolik, I.N. (2002). Importance of Shapes and Compositions of Wind-blown Dust Particles for Remote Sensing at Solar Wavelengths, Geophys. Res. Lett., 29(10), 38-1-38-4, doi: 10.1029/2002GL014947. Kalashnikova, O.V., Horanyi, M., Thomas, G.E., and Toon, O.B. (2000). Meteoric Smoke Production in the Atmosphere, Geophys. Res. Lett., 27(20), 3293-3296, doi: 10.1029/1999GL011338.